We offer a minimum of 6 night’s accommodation with match tickets, but we would be happy to look at additional nights and stays in cities other than those published above. Glory Days recommend Bronze that will give a low seat but probably some shade. These possibly will be near the Barmy Army Bays. 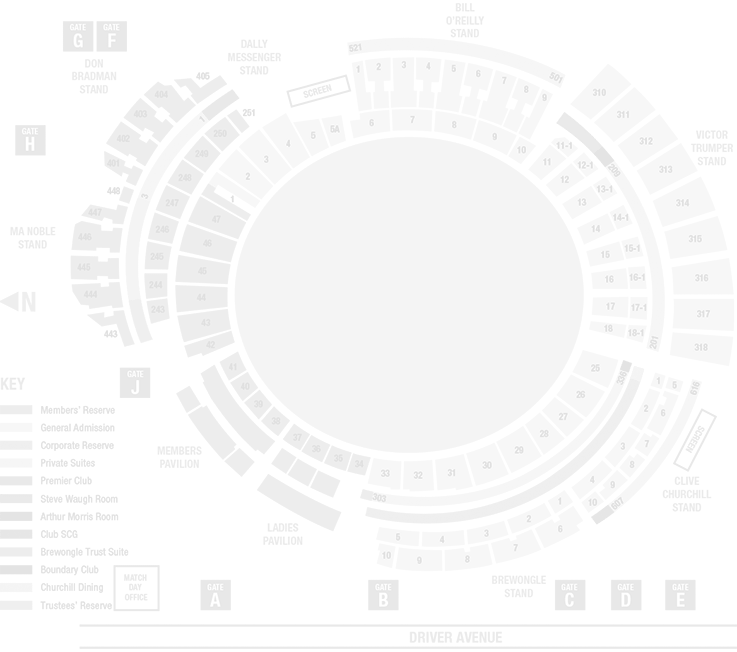 The Gold and Platinum will offer great views at a good level behind the Bowlers arm. The Brisbane Cricket Ground (BCG), affectionately known as the Gabba, is a 38,000 seat oval sports venue which hosts Australian Football League (AFL) and national and international cricket events. The Gabba is an icon of the Brisbane landscape and is the home ground for the Brisbane Lions AFL team and the Queensland Bulls state cricket team. From October to March The Gabba is used for cricket and is home to the Queensland Cricket Association, Queensland Cricketers Club and the Queensland Bulls cricket team. The venue usually hosts the first Test match of the season each November. The Gabba is on the South side of the city and generally there are free shuttle buses from the City Centre to the stadium. It is walkable but not recommended. • Silver: Level 3 of the Eastern Stand, Square of the wicket. Glory Days recommend the General Admission which will provide access to the grassed verge – this is not for the faint hearted as it will be a busy and not guaranteed seated area (many stand). It is generally behind the Barmy Army bays. The Gold and Platinum in the Riverbank Stand provide great views and access to the new superb facilities in the new stand. Adelaide’s historic cricket ground, otherwise known as the Adelaide Oval is one of the world’s most famous cricket pitches and is one of the world’s most picturesque. Centrally located on War Memorial Drive, North Adelaide it is in easy reach of Adelaide’s hotels and centrally located accommodation. Capacity is 53,500. It is a beautiful and iconic walk taking you across the River to the Oval with the excitement building for the days play! The WACA is an iconic cricket venue with a capacity of over 20,000 and has one of the fastest and bounciest pitches. It is conveniently located close to the East of the city centre and therefore easily accessible from various central locations. With many hotels in the nearby area, visitors can enjoy a nice stroll through the park that leads to the stadium. Ticket category locations to be released soon. • Gold: Level 2 Ponsford Stand Square of the Wicket. Glory Days recommend the Bronze as this will provide an English style view. The MCG is huge and level 3 will be more elevated than we are used to. Gold and Platinum as usual will provide excellent views more behind the bowler’s arm. The MCG has hosted high profile events, from the 1956 Olympics to the Melbourne 2006 Commonwealth Games, and concerts by the Rolling Stones and Madonna. With a seating capacity of 100,000, the MCG hosts more than 90 days of cricket and Australian Rules football each year, with more than 3.5 million people passing through the gates annually. It’s a lovely walk from the City Centre to the MCG and much of the walk is next to the beautiful Yarra River. After the match head back to the Southbank and its array of bars to cap a wonderful Ashes experience on boxing day! Glory Days recommend the Gold mainly due to iconic views of the backdrop of the city behind the opposite stand. The Silver here also provides great views and reasonable shade. Situated in Moore Park in the city’s east, the Sydney Cricket Ground is one of the world’s most famous cricketing venues. For a stadium in a major city, it has a relatively limited capacity (close to 44,000) but this has the direct benefit of ensuring that spectators are close to the action from virtually any point in the ground. The SCG is in the same complex of the Sydney Football Stadium which is also used for many great sporting functions. The walk to the City from the SCG passes Surry Hills and Paddington which have great options for a drink at the end of the day.